It's July 1964 in the period when American troops were euphemistically termed "military advisors" in Vietnam. 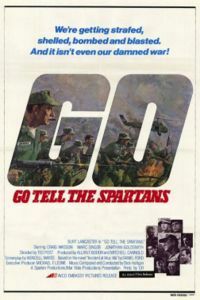 Major Asa Barker (Burt Lancaster) has been given this command: a poorly-manned outpost named Muc Wa in rural South Vietnam somewhere near the rural Da Nang to Phnom Penh (Cambodia) highway that a decade earlier had been the scene of a massacre of French soldiers during the First Indochina War. Barker is a weary infantry veteran in his third war (he served in the Pacific during World War II as well as in the Korean War), who provides veteran supervision to a cadre of advisors attached to a group of South Vietnamese who garrison the deserted village of Muc Wa. Barker, as a seasoned officer, knows that he cannot defend his position due to lack of numbers and the quality of his local troops. He is still obliged to carry out the orders of his superior, General Harnitz (Dolph Sweet), who sends Barker U.S. re-enforcements to appease him. His command consists of a handful of U.S. soldiers (encompassing the inexperienced, unhappy, idealistic and glory-seeking) and some reluctant former Vietnamese paddy farmers turned militiamen. Barker is a capable commander who has ended his career by having an affair with a senior officer's wife. He argues that the hamlet is deserted and has no importance, but sends a detachment from his command. The detachment is commanded by the brash but nervous Lt. Hamilton, and includes veteran Sergeant Oleonowski, who is suffering from battle fatigue, a drug-addicted medic, Cpl. Lincoln, and a young draftee, Cpl. Courcey, who quickly befriends an elderly native volunteer, nicknamed "Old Man". The American troops along with around 30 South Vietnamese troops and similar number of milita, set out from their base at Pangan to Mu Wa. On their way to Muc Wa along a dirt road, the column is ambushed at a roadblock, resulting in the sadistic ARVN Cpl. Nguyen "Cowboy" (Evan Kim) capturing and beheading the lone Viet Cong attacker. On reaching the hamlet, Hamilton sets up his defenses in a triangular formation and receives supplies brought in by helicopter. At the rear of the hamlet is a graveyard of 302 French soldiers with a placard above the entrance that reads, in French, ''"Étrangers, dites aux Spartiates que nous demeurons ici par obéissance à leurs lois"'' (Stranger, tell the Spartans that we remain here in obedience to their orders), which refers to the Battle of Thermopylae. While he is investigating it, Courcey spots a one-eyed VC soldier, who is presumably a scout. Back at Barker's base, he receives a Psy-ops officer who claims that he will be able to predict which one of Barker's outposts the VC will attack next. During a patrol, Courcey spots a group of nine Vietnamese women and children fishing along the small river that runs through the deserted Muc Wa village, despite intelligence that there are no civilians said to live in the area. Cowboy wants to kill the civilians for they might be Viet Cong sympathizers, but Courcey stops him and lets the civilians take shelter in their base camp. Courcey befriends one of the civilians, a teenage girl, whom takes a liking to him despite the language barrier. That evening, the VC attack Muc Wa by a harassing attack where the doped up Lincoln is wounded. Coursey leads an ambush patrol that kills the four Viet Cong mortar crew. The next morning, Barker travels to Saigon to meet with Colonel Minh, the military chief of the region where he tries to persuade him to send reinforcements of at least 300 ARVN troops to Muc Wa. But the corrupt Minh refuses for he claims that he needs the troops to stay in Saigon to prevent a potential coup. The following night, Muc Wa is again attacked by the VC, sustaining its first casualties when Lt. Hamilton is killed when he tries to rescue a wounded militaman, along with a few South Vietnamese soldiers. The next day, Sgt Oleonowski commits suicide rather than face the pressure of command. When Barker is informed of the deaths, he wants to pull his troops out now that they lack an experienced leader, but this request is refused by Harnitz, forcing Barker to send his own deputy to Muc Wa. When the psy-ops man predicts Muc Wa will be attacked, Barker contacts them by radio only to learn that they're under attack from the Viet Cong. True to Barker's predictions, the outpost is attacked again by the massive numbers of Viet Cong who number in the many thousands, not the few hundred predicted by the high command, and they are all well armed with various automatic weapons, not outdated rifles. Barker is forced to threaten Harnitz over the radio to send air support for Muc Wa in which several helicopters and flare ships arrive just in time to stop the Viet Cong attack. The next day, Barker receives orders by Harnitz to withdraw all of the American troops from Muc Wa which is believed to be under siege by the 1,000-strong 507th Viet Cong battalion. Barker personally flies out to Muc Wa to evacuate the surviving Americans as well as the wounded by helicopter, but leaving behind the South Vietnamese troops, including the walking wounded. The idealistic Courcey refuses to leave the wounded, so Barker stays behind with him to help evacuate the remaining South Vietnamese troops and militiamen overland to safety. This leaves Barker, Courcey, Cowboy, the Old Man and his fellow South Vietnamese militiamen at Muc Wa. That evening, the Vietnamese civilians that Courcey found and brought into the base camp steal several weapons and try to escape, forcing Cowboy to kill all of them. But the Vietnamese teenage girl gets away and informs the Viet Cong scouts of the Americans plans to withdraw... thus revealing that she and all of the other civilians were in fact Viet Cong supporters (as Cowboy predicted) after all. Barker and Courcey are forced to blow up all of the arms and equipment left behind and then leads the group on the road as friendly artillery fire begins raining down on the area. But no sooner has the group filed out, they are ambushed on the road by the Viet Cong, led by the civilian girl. In the ensuing battle everyone is killed, including Barker who tries to help Courcey when he is wounded. Barker then collapses and apparently dies from a heart attack, while the Old Man drags Courcey to hide him in the nearby bushes as the enemy Viet Cong attack from all directions. The only survivor of the battle is ironically the willing volunteer, Courcey, whose idealism and enthusiasm for the Vietnam War has now been killed along with all his comrades. He wakes up in the morning to find that everyone else is dead and the soldiers, including Barker, are stripped of their fatigues. The VC have withdrawn having left him for dead. As Courcey wanders to the grave site, he finds another survivor: the wounded, one-eyed VC scout that he saw earlier. The VC points his rifle at Courcey before dropping it out of exhaustion. Courcey says to the one-eyed VC, "I'm going home, Charlie, if they'll let me" as he wanders off the grave site and onto the dirt road leading away from the ruins of the village. An on-screen caption emphasizes the date: "1964".